What are the Goals, Frequencies used, and the Health Effects? The Smart Grid is a dream of tech savvy people – and Industry. In reality people have survived for thousands of years without wireless, let alone electricity. Do we really need all this data monitored and faster downloads? Industry wants us to have faster access to all sorts of media, plus monitor our daily usage of power, be reminded by our refrigerator and washer machine. Many people find it hard to do everything in one day as it is, adding more and more things to do, keep track of and watch will really help us save time? The question is why the rush to get to this dream network, won’t it only create a need for something even faster after that? The bigger question is why is it all wireless? Industry could have made a majority of the Internet of Things (IoT) all wired and safe, but they seem to see a brighter future in wireless. Is it because companies that create wireless devices, networks, software, and appliances – all of them are seeing a future only with wireless? With the health effects of wireless, especially those 5G may cause in the near future, Industry may be faced with a BIG delma. After investing billions into a wireless world, they just may have to take some steps backwards. Avoiding the known health effects and proceeding with 5G may come back to haunt not only industry, but Governments around the world for accepting the concept without any proof to support that 5G is safe. British Columbia is GROUND ZERO for the SMART GRID. Downtown Vancouver is the “Living Lab”. If 5G is as dangerous as it sounds, People in Vancouver will be the first to experience health issues. Its possible Doctors are already seeing people about skin problems and other side effects from it, but few doctors are aware that this is even underway in British Columbia. Telus is not the only one, Bell is also working on 5G tests, Shaw and Rogers are likely very busy too. Years from now, to some people, life in the future will be more technology friendly, as Telus always says, thanks to the new 5G networks, however will it be safe for the health of Canadians? If its not, someone will have to answer why wired was not used instead. Their answers will be cost and speed. Health is always the subject companies and governments want to ignore when it comes to wireless. As Canadians, we want to know the truth about 5G now, before it continues to other streets, other cities, other provinces and other countries. Health Canada, Industry Canada and wireless industry have a lot of explaining to do. They may want to simply scrap wireless in areas where there are no reasons for it not to be wired, that would be a start, but it will never solve the health risks of the remaining part of the grid. People across the United States are expressing their concerns about 5G network on telephone poles, placed in front of homes in various states. Canadians are encouraged to read what is already happening here in British Columbia, Quebec and Ontario. Its being installed right now, not later on. Canadians are encouraged to contact Industry Canada, Health Canada and their local representatives about this subject. Bell today announced that it has successfully demonstrated Fifth Generation (5G) mobile technology in collaboration with Nokia. Conducted at Bell’s Wireless Innovation Centre in Mississauga, the trial leveraged spectrum in the 73 GHz range to achieve sustained data speeds more than 6 times faster than top 4G mobile speeds now available in Canada. Expected to be widely available within the next 5 to 7 years, 5G will provide significantly faster data speeds than current 4G networks and more capacity to meet the demands of mobile customers for broadcast video and Internet of Things (IoT) applications, including connected vehicles and city-wide IoT solutions. Bell is a member of the Next Generation Mobile Networks consortium (ngmn.org), the global body defining requirements for the international 5G ecosystem. Canada’s largest wireless carriers are entering trial phases in preparation for the next generation of mobile networks, 5G. In a recent article by The Toronto Star, Bell reported that its testing would begin shortly. The Next Generation Mobile Networks consortium (NGMN) is an international group of CTOs from over 20 large telecom operators. Its stated focus is delivering global and commercially-available 5G by 2020, while also accelerating the development of the LTE-Advanced ecosystem. 5G standard data rates are expected to measure in at 10gbps over the air, giving users a boost of up to 40 times today’s 4G/LTE network standards. In real world application, this means 5G users could download a 4K video in ten seconds, or stream two 4K connections simultaneously. Telus is also hard at work attempting to bring 5G into reality. In November 2015, Telus announced it was working with Huawei, which is not only a widely known Chinese OEM but also the world’s largest telecommunications equipment manufacturer, to create a “5G Living Lab,” in downtown Vancouver. The lab was established to provide fibre-wireless internet speeds in downtown Vancouver. “The opportunity to partner with Telus to deploy innovative new technologies is critical to our global 5G research and development process and positions Telus on the leading edge of next-generation telecommunications technology deployment,” said CEO Ken Hu in a statement at the time. That was not the first time Huawei invested in Canada’s 5G technology, having been involved in development programs for the past several years, and it preceded an even larger announcement. In March 2016, Huawei also announced it was investing $303 million over the next five years in Ontario’s 5G acceleration program, in which the provincial government also planned to invest $16 million. “Ontario has a vibrant innovation ecosystem that we’ve been proud to be a part of for the past six years, so we’re incredibly excited about expanding our research and development facilities in the province. Our Canadian research team is helping to drive pioneering projects around the world, and this accelerated investment in the Province of Ontario reflects our confidence in Ontario, and the talent of Ontario’s skilled ICT workforce,” said Hu. Rogers Communications, while quiet about its trials, also states that it is taking part in standards setting through the various industry bodies involved. SHENZHEN, CHINA – Huawei, one of the world’s largest telecommunications and ICT suppliers, today announced a memorandum of understanding with TELUS, Canada’s fastest growing national telecommunications company, to establish a “5G Living Lab”. This innovative new project will test approaches to deliver a next-generation converged fibre-wireless network in downtown Vancouver. 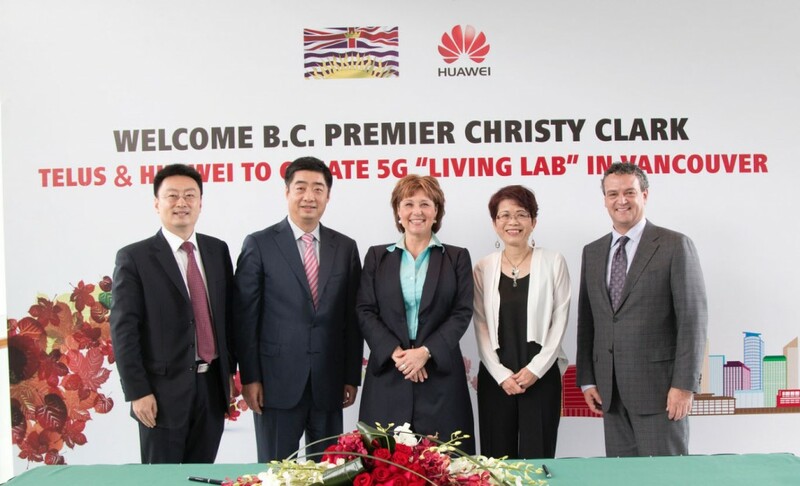 The announcement was made on the occasion of the visit of the Premier of British Columbia, Christy Clark, to Huawei’s headquarters in Shenzhen. To support this ”Living Lab”, Huawei will be making a significant investment to design, test and deploy ground-breaking new technologies, leading towards the development of next-generation 5G based telecommunications networks. This agreement follows TELUS’ recently announced $1-billion investment to expand its fibre optic network in Vancouver, which will ultimately provide the backbone to support highly efficient and lightning-fast wireless speeds as the development road maps for wireless and wireline networks converge around 5G concepts. Together, Huawei and TELUS are helping the City of Vancouver deliver upon its goal of becoming the worlds’ greenest city by 2020 through providing network capacity and speed that will enable “smart city” and other sustainability-focused technology initiatives. Huawei is a leading global information and communications technology (ICT) solutions provider. Huawei’s 177,000 employees worldwide are committed to bringing advanced communications technologies to operators, enterprises and consumers around the world. Huawei’s innovative ICT solutions, products and services have been deployed in over 170 countries and regions, serving more than one third of the world’s population. Founded in 1987, Huawei is fully owned by its employees, and was recently named again by Interbrand as one of the world’s top 100 brands – the first Chinese company to receive this recognition. Huawei Canada has been in operation since 2008. Huawei’s innovative wireless products and services support many of Canada’s leading telecommunications companies, and Huawei’s Canada Research Centre in Kanata, Ontario is a global leader in advanced communications technologies. We are proud to be a key part of Canada’s ICT Ecosystem. 5G Ontario is expected to create 250 new R&D jobs in the province. The Ontario government and telecom gear maker Huawei Canada yesterday announced plans to pour some $316 million dollars into a research and development project focused on 5th generation wireless technology and positioning the province as a global tech hub. The project, called 5G Ontario, will see Huawei Canada invest a total of $300 million, over a five-year period, in advanced communication research that will create 250 R&D jobs in the provinces as the company establishes new research laboratories in its facilities in Ottawa, Markham and Waterloo. The Ontario government will invest up to $16 million through the province’s Jobs and Prosperity Fund to support 5G Ontario.“This builds on my first trade mission to China in 2014, where it Huawei announced it will invest $210 million to expand R&D in Ontario and create 250 top quality, high-skill jobs,” Premier Kathleen Wynne said yesterday during her visit to Huawei’s Canadian headquarters in Markham, Ont. Our top priorities are economic growth and creating good jobs.”Wynne’s trade missions to China in November 2015 and to India earlier this year, are expected to create approximately 1,850 jobs in Ontario through more than 100 agreements and memoranda of understandings. The total value of the agreements is estimated at $2.8 billion. the premier led two trade missions to China. Her 2014 trip resulted in nearly $1 billion new investment in the province while here 2015 trip resulted in agreements worth approximately $2.5 billion.“Huawei is expanding its R&D operations in Ontario because it has a vibrant innovation ecosystem and an excellent pool of technology talent,” said Sean Yang, president of Huawei Canada. “Good things grow in Ontario.5G denotes the next phase of mobile telecommunications standards, according to Yang. “It is capable of speeds up to 100 times faster than the current 4G technology.”5G Ontario will focus on research initiatives around faster Internet speeds, as well as related technologies such as cloud computing, data analytics, and mobile security, according to Scott Bradley, vice-president of corporate affairs for Huawei Canada.“Our initiative has three parts,” he said. “One is concerned with making the transmission of data from point A to point B faster. The other concerns what you with the data. And that concerns computing capacity and storage capacity. And the third is about application–how to get information out of sensors and how to manage it and maintain integrity.”Bradley said 5G products will likely begin being rolled out by 2020. Canadian mobile users should expect a speed increase with today’s news that Bell Canada has been working with Nokia Corp. to successfully demo 5G network technology. Just don’t expect it anytime soon, according to the communications company. Conducted at Bell’s Wireless Innovation Centre in Mississauga, Ont., the “ pre-commercial 5G system” trial used spectrum in the 73 GHz range to attain sustained broadband data speeds more than six times faster than current 4G mobile speeds available in Canada, Bell claimed. Canada’s big three of telecommunications organizations — Bell, Rogers Communications, and Telus Corp. — have all been working to test and build out their respective 5G wireless network architecture. The question remains, however, is which carrier will be able to define a technology standard and deliver first. The promise of ultra-fast 5G networks — including reduced latency and connectivity issues — are all about improving digital content delivery. For the enterprise, this involves, for example, minimizing buffer delays during video conferencing, improved data streaming capabilities, and more seamless wireless and cellular network transitions. The technology is expected to deliver the “tipping point” as far as enabling the network to successfully handle the capacity and demand requirements for emerging tech such as the Internet of Things (IoT), smart vehicles, and connected enterprise devices. Don’t expect these speeds anytime soon, however. Widespread availability of Bell’s 5G network isn’t expected for another five to seven years. But the successful trial is evidence of Canada’s ability to “compete in a digital world,” according to the Navdeep Bains, Canada’s minister of innovation, science and economic development. “This successful trial of next-generation 5G here in Canada is one example of how our country can become a global centre of innovation by being early adopters of emerging technologies,” Bains said in a statement. Canadian telecom operator Bell has jumped into the “5G” technology trial morass, announcing a successful demonstration with partner Nokia. The demonstration, which was conducted at the carrier’s Wireless Innovation Center in Mississauga, Ontario, tapped into spectrum across the 73 GHz band in providing “sustained data speeds more than six-times faster than top 4G mobile speeds now available in Canada.” Bell Canada currently touts that its LTE-Advanced network produces downlink speeds of between 12 megabits per second and 100 Mbps. Bell, which has a nationwide network sharing arrangement with Telus, expanded its mobile focus earlier this year announcing plans to acquire Canadian regional carrier Manitoba Telecom Services for 3.9 billion Canadian dollars ($3 billion). As part of the deal, Bell said it would sell one-third of MTS’ postpaid customer base and assign one-third of MTS dealers to Telus for an undisclosed sum. A number of U.S.-based carriers also have begun trialing 5G technology, including Verizon Wireless, AT&T Mobility, T-Mobile US and Sprint. Similar to Bell, Sprint has worked with network partners on using the 73 GHz band in support of the trials. Canadian telecom regulator Industry Canada has so far not made any moves in terms of specifying certain spectrum resources in support of 5G services. The Federal Communications Commission last month moved forward on its Spectrum Frontiers initiatives in a move to specify spectrum for 5G, including 3.85 gigahertz for licensed use in the 64-71 GHz bands and 7 gigahertz for unlicensed – or “flexible” – use across the 28 GHz, 37 GHz and 39 GHz bands. With last week’s 5G-related announcements, the U.S. is again poised to be a leader in the development and deployment of next-generation wireless technology. Tom Wheeler, head of the FCC in the US (comparable to Ind. Canada), who has had a long history of working for and with the telecom industry, gave one of the scariest speeches ever, basically saying that technology was to be allowed to develop and be used without regulation, without concerns for any ramifications. Technology at all costs, even the health of future generations. This approach and the use of 5G will apply to non-licensed frequencies as well as licensed, which means things like wifi and $$meters and other devices we haven’t heard of could use these untested, unsupervised signals. Josh del Sol is a tireless warrior informing the public about the health impacts of RF, EMF and other ubiquitous frequencies. His documentary Take Back Your Power is foundational to understanding the problem. Today, I received an email from him regarding a spontaneous conversation another activist had with an AT&T line-man working on a cell tower. I have copied the conversation below. Meanwhile to have a deeper understanding of this truly menacing issue, you can go to openmindsshow.com to see my interview with him. Reallocate and Repurpose Spectrum for Next Generation Uses: Hillary will enhance the efficient use of spectrum by accelerating the process of identifying underutilized bands, including ones now used by the federal government, that can become more valuable under revised regulatory regimes. She will focus on the full range of spectrum use policies—including new allocations for licensed mobile broadband, as well as unlicensed and shared spectrum approaches. She believes that creative uses of shared/non-exclusive uses of spectrum could unleash a new wave of innovation in wireless broadband technologies and the Internet of Things, much as WiFi did in the first generation of digital services. Foster a Civic Internet of Things through Public Investments: Hillary will dedicate federal research funding to test-bedding, field trials, and other public-private endeavors to speed the deployment of next generation wireless networks and a civic Internet of Things. Governments around the world are already investing billions of dollars in developing and commercializing 5G technologies, and Hillary wants American companies to lead the world in wireless innovation. Her investments will aim at using advanced wireless and data innovation to drive social priorities in a range of areas, such as public safety, health care, environmental management, traffic congestion, and social welfare services. Mark Lowenstein, Vice-President of Strategy at Verizon Wireless, quoted studies stating that the current approach for 5G wireless internet will require one 30-foot tower for every twelve homes. Obama Commits $400M to New Wireless 5G Technology; Hillary Bailout? Obama said July 15 that the National Science Foundation, funded by $7 billion in government funds, will pledge $50M over the next five years as part of an $85M investment by NSF and private sector companies “to build the testing platforms starting with the 2017 fiscal year.” NSF is also committing $350M over the next seven years that will “take research from the concept phase to real-world testing at scale,” he said. Health advocates noted that health and environmental considerations were absent from Obama’s statement.